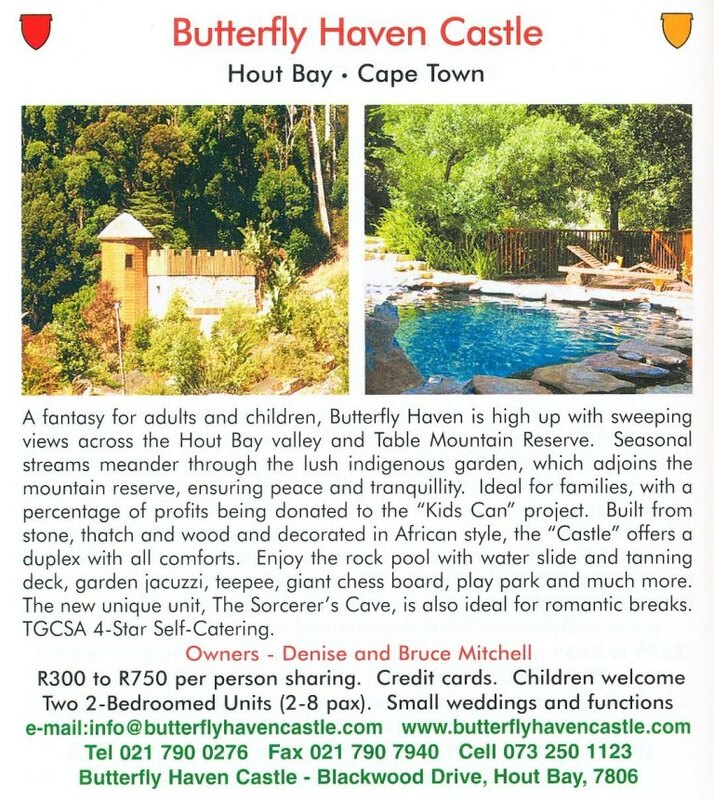 This is the long and winding tale of Butterfly Haven Castle (BHC). 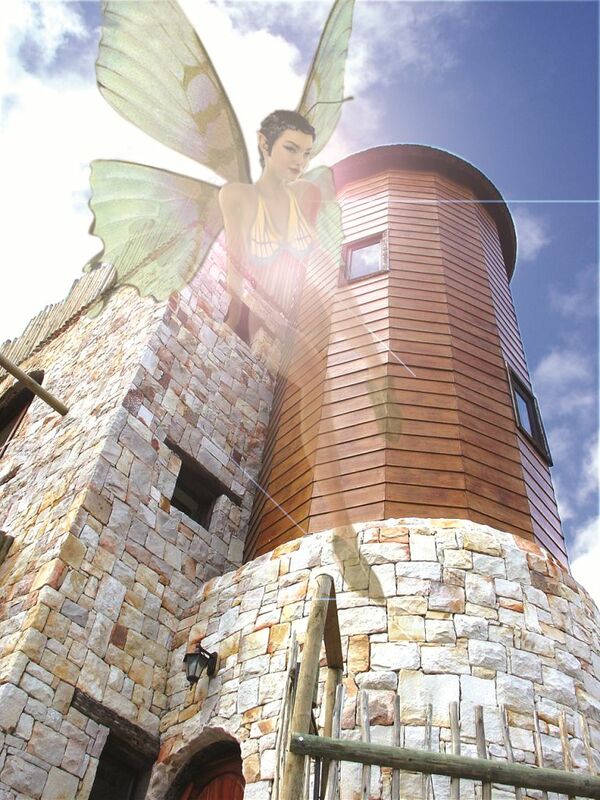 BHC was a spiritual grand design - a very unusual, elaborate and magical homebuilding project. BHC was the work of Bruce Mitchell (project manager) and Denise Stephani (who did all the marketing and other vital roles). Here is a tourist flyer (click to enlarge). We lived in Hout Bay, a suburb of Cape Town in South Africa. Within Hout Bay, we were near Constantia Nek at the back end of Table Mountain with the most magnificent view. A plot of 4,000 metres squared (one acre). Seasonal streams and waterfalls for several months per year. 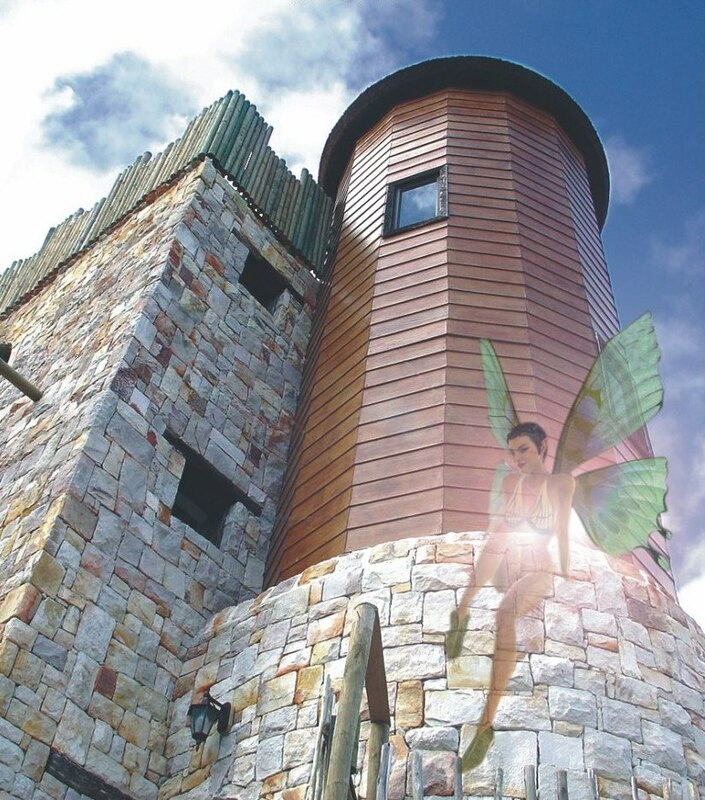 It tells of how a double garage and maid's room transformed into a four-floor magical castle with battlements and thatched tower. 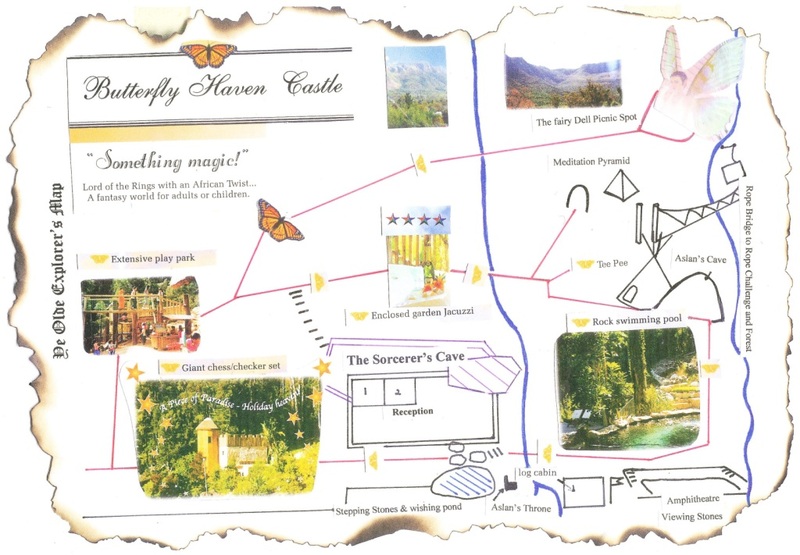 A fairy-friendly fortress we called Butterfly Haven Castle. It unearths how a mass of soil and rock under a house was removed to create a cave retreat suitable for wizards, warlocks, witches and sorcerers - Sorcerer's Cave. This Herculean task for myself and Denise Stephani (and our infant sons) took about five years (1999-2004) and literally hundreds of contractors. Lucky - or perhaps not - that the mammoth nature of the task was unknown when we started. If had known, would not have started. Also, would swap a successful intimate relationship for it all! Definitely an initiation, a trial by fire (more on that later), a journey to a non-academic Masters Degree in Construction Management & Spiritual/Creative Manifestation! In terms of relationships and construction, so many difficult situations to handle, some never resolved. Icy disagreements happened and even a few very dark fallouts. Alongside our attachment parenting lifestyle, it was really two boot camps in one! The excellent project engineer Rob Hart - who has been engineer on huge projects such as sports stadiums with unusual roofs as far afield as Arabia - said very few Cape builders could have achieved this. He also suggested it was my Magnum Opus, my greatest piece of work. At the time I didn't think so, as I thought I had more in me. As I write this, perhaps 14 years later, I consider my website, my children and my website as my masterpieces. And there be more projects to come yet! A special thanks to certain dedicated workers who participated throughout most of it: Mondli Cetyiwe of Nyanga and Aikel. Thank you also to certain contractors who were so very helpful: Caril de Beer (joinery), Kurt de Beer (tree felling), Garth Halvorsen (builder), Gerhardt Van Zyl (builder), Deon Schalkwyk (stone supply). A massive crane was used to lift the slabs for the roof of the castle into place. It was an organic project in that it did not use an architect, and grew bit by bit from wild inner imaginings. It started as somewhat of an environmental project to save the indigenous flora and fauna of this fabulous ecoregion from invasive gum/eucalyptus trees. When the first colonialists arrived, they used the indigenous trees for building. But they replaced them with the water-greedy, highly inflammable gum trees from Australia that smothered indigenous flora and from which indigenous fauna fled. These were towering forests of eerie silence. We even were caught up in the Great Fire of 2000, the furious fire steadily descending the koppie until reaching the edge of our property, perhaps only 30 metres from our home. Helicopters were constantly water-bombing it. Fortunately, the wind changed and it went uphill and away. We had only one son at the time and he slept through it! Even if you cut the alien tree invaders down, they would need intense herbicides to kill them off. Otherwise they kept on resurging and they grow so rapidly. This alien annihilation allows the extremely biodiverse and endemic fynbos to all of a sudden rejoice and flourish back into life. We also planted hundreds of native trees like yellowwoods (the national tree of South Africa). This ripping out of the old and the initial groundworks caused massive chaos on the property, such that I felt like that there was no way the property could now be sold. We had to finish the project - although there was no clear finish line. Definitely a chaotic nightmare that I would not want to repeat. It thrived as a 4 star self-catering guesthouse (2005-2007). 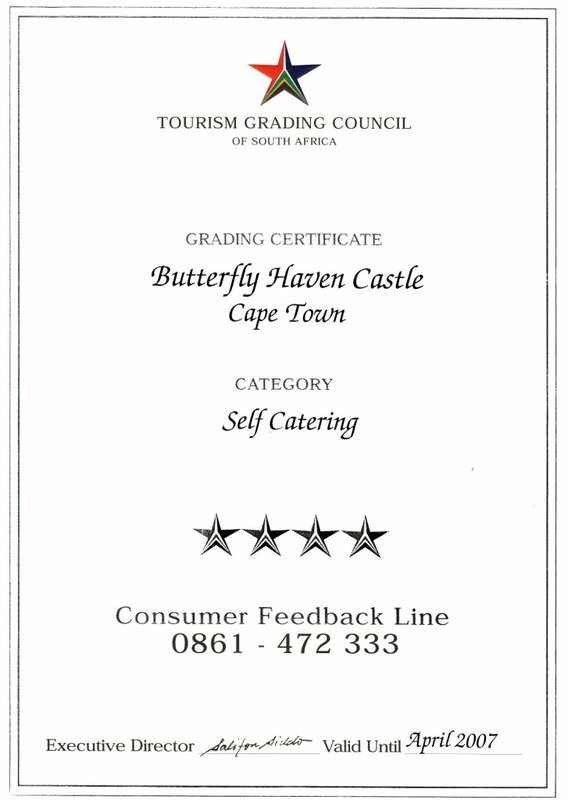 This was assessed by the Tourism Grading Council of South Africa (also see here). It was in the Portfolio Retreats Collection for 2005/2006 and 2006/2007. It was in Special Spots 2005/2006 (by invitation only, distributed by Lufthansa, SAA, etc.). It was also very popular for kid's birthday parties, where Denise shone as the magical fairy in charge of cake ceremony gatherings in tipis, wee folk dances and other pixie jinx. It also helped the disadvantaged. Hyperlinks still exist 10 years after its 2007 closure. The vision had a limited budget, at least compared to the very wealthy film producer two doors away. When it was sold, all expenses were recouped. No profit was made. It broke even. It really needed far more accommodation units to succeed in a business sense. We really needed to live away from the place of work. It was too intense doing this massive project alongside our also highly unusual and magical attachment parenting project. There was no extended family or village. For me, there was no break from being plunged into the daily grind of maintenance and the creation of yet another enchanting feature. When we were selling it (2006-2007), a famous American rapper viewed it. He was looking to buy in Hout Bay or Cape Town. The property company told us he was a VIP and told us his name. I cannot say with certainty, but I believe it was Kanye West. He came with his entourage of bodyguards and/or friends. I chatted with them on the third floor of the Castle. At the time, I had no idea who he was. Anyway, he had a look around, but clearly it was not for him as I heard nothing further. It featured on SABC's Free Spirit magazine TV show. So why did we leave? Possibly the major reason was the undercurrent of crime in South Africa. Only a few weeks before we emigrated a father was stabbed to death in front of his wife and children only a few doors away. These sorts of extreme asocial events were so common here and indeed in the whole country. We didn't feel we could ethically promote a haven of peace within such a climate of violence. There were too few units to make any money. Didn't want to build yet again, as already burnt out from creating all this! Click on any image and see it larger!